Background and objectives Depression is common in patients on hemodialysis, but data on the benefits and risks of antidepressants in this setting are limited. We conducted a multicenter, randomized, double-blind, placebo-controlled trial of sertraline over 6 months in patients on hemodialysis with depression to determine study feasibility, safety, and effectiveness. Design, setting, participants, & measurements Patients on hemodialysis at five United Kingdom renal centers completed the Beck Depression Inventory II. Those scoring ≥16 and not already on treatment for depression were invited to undergo diagnostic interview to confirm major depressive disorder. Eligible patients with major depressive disorder were randomized to receive the study medication—either sertraline or placebo. Outcomes included recruitment and dropout rates, change in the Montgomery–Asberg Depression Rating Scale and Beck Depression Inventory II, and qualitative information to guide design of a large-scale trial. Results In total, 709 patients were screened and enrolled between April of 2013 and October of 2014; 231 (32.6%) had Beck Depression Inventory II scores ≥16, and 68 (29%) of these were already receiving treatment for depression. Sixty-three underwent diagnostic interview, 37 were diagnosed with major depressive disorder, and 30 were randomized; 21 completed the trial: eight of 15 on sertraline and 13 of 15 on placebo (P=0.05). Dropouts due to adverse and serious adverse events were greater in the sertraline group. All occurred in the first 3 months. Over 6 months, depression scores improved in both groups. Beck Depression Inventory II score fell from 29.1±8.4 to 17.3±12.4 (P<0.001), and Montgomery–Asberg Depression Rating Scale score fell from 24.5±4.1 to 10.3±5.8 (P<0.001). There were no differences between sertraline and placebo groups. Conclusions Although small, this is the largest randomized trial to date of antidepressant medication in patients on hemodialysis. Our results highlight recruitment issues. No benefit was observed, but trial size and the substantial dropout render consideration of benefit inconclusive. A definitive trial could use shorter follow-up and include depressed patients already taking antidepressants. The prevalence of adult patients receiving RRT continues to increase across the developed world. In 2012, the numbers on dialysis ranged from 133 per 1 million population in South Africa to 2903 per 1 million population in Taiwan (1). Patients on dialysis have high morbidity and mortality. Patients’ experience of living with dialysis is significantly affected by many factors, including physical symptoms, substantial comorbidity (particularly cardiovascular), complex dialysis regimens, high pill burdens, and the need for dietary and fluid restrictions (2–4). Although common in this setting, depression is difficult to diagnose, not least because of the symptom overlap between depression and advanced kidney disease (5–7). Estimates of prevalence of depression in patients on dialysis vary between 39% on the basis of screening and 23% on the basis of psychiatric interview (8). Depression is associated with reduced quality of life, increased prevalence of cardiovascular disease, and increased mortality. It may lead to reduced treatment adherence, reduced self-care behavior, and subsequently, greater health care resource use (9–11). The prevailing view is that depression is often unrecognized, and therefore, only a small proportion of patients receives treatment (12–15). There is little research on treatment options, particularly in relation to the use of antidepressant medication (12). A 2009 Cochrane review identified only one small randomized, controlled trial (RCT) with 14 patients. Results were inconclusive (16,17). It is perhaps unsurprising that recent systematic reviews recommended a large well designed RCT in this setting (8,18). National Institute for Health and Care Excellence (NICE) guidance for depression in adults with chronic physical health problems recommends a stepped care approach to treatment, including prescribing medication for people with persistent mild to moderate depression (19). Sertraline, a selective serotonin reuptake inhibitor, has been found to be effective and have fewer side effects than many other commonly prescribed antidepressants, except for diarrhea (20). Several studies found sertraline to be safe for patients with cardiovascular disease (21,22). Given the lack of proven efficacy of antidepressants in this setting and the increased risk of adverse drug events due to severely impaired renal function and the high pill burden, we carried out this study. The primary aim was to assess the feasibility of undertaking a large RCT to evaluate the acceptability and effectiveness of sertraline to treat depression in patients on hemodialysis. Efficacy and safety outcomes were also evaluated. We conducted a multicenter, double-blind, parallel group, placebo-controlled, feasibility randomized trial of sertraline in patients on hemodialysis with mild to moderate major depressive disorder (MDD). Ethics approval was received (National Research Ethics Service Committee London–Bentham: reference 12/LO/1554). The study took place in five renal units in the Midlands and southeast of England and involved screening and trial phases. The study design is more fully described in the published protocol (23). The trial is registered (ISRCTN06146268) and was carried out in concordance with the Declaration of Helsinki. Patients over the age of 18 years old who had been receiving treatment by hemodialysis for 3 months or more were approached. Patients who could not read and speak English were excluded. Consenting patients completed the Beck Depression Inventory (BDI-II) (24) questionnaire. Data relating to demographics, medical and psychiatric history, and dialysis treatment were also collected. Those with a BDI-II score ≥16 not on treatment for depression (antidepressants or psychologic therapies) currently or in the past 3 months and without any predefined exclusion criteria, which included planned living donor kidney transplant within the period of the trial, a prognosis of <1 year, several associated medical conditions, and contraindicated medications (Table 1), were approached to undergo a diagnostic interview by a psychiatrist using the Mini International Neuropsychiatric Interview (25) to confirm the presence of MDD. After this, consenting patients diagnosed with mild to moderate MDD and a score of 18 or above on the Montgomery–Asberg Depression Rating Scale (MADRS) (26) were randomized into the trial phase. Patients with severe depression or suicidal ideation were excluded and referred urgently to psychiatric services. Patients who had evidence of cognitive impairment on the Folstein Mini Mental Status Examination using a cutpoint of 23 were also excluded (27). We sought written informed consent from patients at three separate points in the study: before screening, before diagnostic interview, and before randomization to enter the trial. After confirmation of MDD, the study psychiatrist used a web-based randomization program (Norwich Clinical Trials Unit [CTU]) to assign patients to receive either sertraline hydrochloride or placebo. Block randomization with stratification for each center was used. The placebo was microcrystalline cellulose and magnesium stearate. Sertraline and placebo tablets were identically encapsulated (Royal Free Hospital Drug Manufacturing Unit). The patients, dispensing pharmacies, study psychiatrist, research nurses, all clinicians, trial manager, and study statistician were blind to the allocation of the study medication. The CTU data manager and the manufacturing pharmacy held the randomization list. After randomization, patients were prescribed the study drug at an initial dose of 50 mg daily. Patients were reassessed by the psychiatrist at 2 weeks and 2, 4, and 6 months and assessed monthly by the research nurse. MADRS was repeated at 2, 4, and 6 months, and BDI-II was repeated at 6 months. There was an option for the psychiatrist to increase the dose of study drug to a maximum of 100 mg at 2 and 4 months if deemed indicated. Routine biochemical and hematologic data were collected monthly along with information on adverse events and serious adverse events (SAEs). Plasma samples for pre- and postdialysis sertraline levels were obtained at the fourth or fifth follow-up appointment. Semistructured interviews were carried out in a subgroup of 16 patients to explore their experience of taking part in the trial. We assessed both feasibility and clinical outcome measures, which are listed in the published protocol (23). The primary feasibility outcome was the number of patients, emerging from the screening phase, who entered and completed the RCT. Secondary outcomes included the number of patients not meeting the eligibility criteria, the number who refused to take part in the trial, the number who withdrew from the trial, the reasons given, and the number and nature of adverse events reported. Changes in MADRS and BDI-II scores over the course of the study were also evaluated. To estimate medication adherence, we also analyzed information on the number of returned tablets and pre-and postdialysis sertraline levels. As a feasibility study, sample size was determined by the need to estimate the population variance of the outcome measures and pragmatic considerations about potential recruitment. A sample size of 30 per arm (n=60) was selected, allowing the population variance to be estimated with reasonable precision (1.2× variance). Previous studies suggested that 30% of patients would screen positive on the BDI-II, that 50% of patients scoring ≥16 on the BDI-II would be subsequently diagnosed with MDD, and that 50% would agree to be randomized. Given a target of 60 patients representing 7.5% of the screen sample, the target for screening was 800 patients. To explore the feasibility of the study, the analysis focused on the conversion of patients from screening to randomization, protocol and drug adherence, and the patients’ experience of participating in the trial. Analysis was also planned to evaluate both the observed variance in the clinical outcome measures (MADRS and BDI-II) to allow estimation of the effect size and the observed gain in the outcome given treatment by sertraline versus placebo (accepting limitations in study power). We also evaluated the number of adverse events. With regard to efficacy, all available patient data were included in estimated parameters. Baseline characteristics of the patients dropping out and completing were compared. Most reporting was descriptive, but where comparisons are reported, a t test was used (between groups or repeated as appropriate). Analyses were carried out using STATA, version 13.1 (StataCorp.). An independent data monitoring committee, consisting of a statistician, a nephrologist, and a lay person, oversaw the study. They met twice during the study. The study took place over 25 months between April of 2013 and May of 2015. The Consolidated Standards of Reporting Trials (CONSORT) flow diagram for the study is shown in Figure 1. We approached 1353 patients to enter the screening phase. Two hundred forty-three were excluded, mainly due to inability to read and understand English. Of the remaining 1110 patients, 709 (64%) consented and underwent screening. On screening, 231 (32.6%) patients had a BDI-II (24) score of 16 or above. Of these, 39 (16.9%) were not considered for the trial phase because of current antidepressant medication, 12 (5.2%) were not considered because of current psychologic therapy, and 17 (7.4%) were not considered for both reasons. Other reasons for ineligibility were medical and other psychiatric problems (34; 14.7%) and contraindicated medications (17; 7.4%) (Table 1). Thirty-eight (16.5%) patients declined to consent. Trial profile. BDI-II, Beck Depression Inventory II. Sixty-three of those eligible for the trial phase consented to be seen by the study psychiatrist for diagnostic interview. Thirty-seven (58.7%) of these patients were diagnosed with MDD. However, three had recently started antidepressants, one had severe cardiac disease, one severe cognitive impairment, one was diagnosed with substance misuse, and another preferred to be seen by their primary care physician. Thirty consented to enter the RCT. On unblinding, it was apparent that 15 had been randomized to each group. Baseline characteristics were similar in the sertraline and placebo groups. The sample was predominately men (77%). The sertraline group was, on average, 5 years older. For the whole study sample, mean age was 59.0±13.8 years old; 60% were white, 20% were Asian, and 20% were other ethnicities. Fifty percent were married or living in a civil partnership, and 33% lived alone. Over 80% had at least one comorbidity, with diabetes and heart disease being the most common. Thirty-three percent had a history of depression, and 17% had previously used antidepressants (Table 2). Twenty-one (70%) patients completed the trial: eight (53%) in the sertraline group and 13 (87%) in the placebo group (P=0.05). In the sertraline group, there were six dropouts within the first 2 months. One patient died of cardiac arrest having taken one tablet. Three patients withdrew because of adverse events (one after 3 days with nausea, another after 12 days with headaches and dizziness, and the third due to insomnia after 23 days). The fifth patient withdrew because of concern about side effects, having taken no study medication. The sixth patient was admitted for a prolonged hospital stay with leg ulcers shortly after randomization and subsequently withdrawn without having taken any study medication. At 3 months, a seventh patient withdrew because of sweating and palpitations. 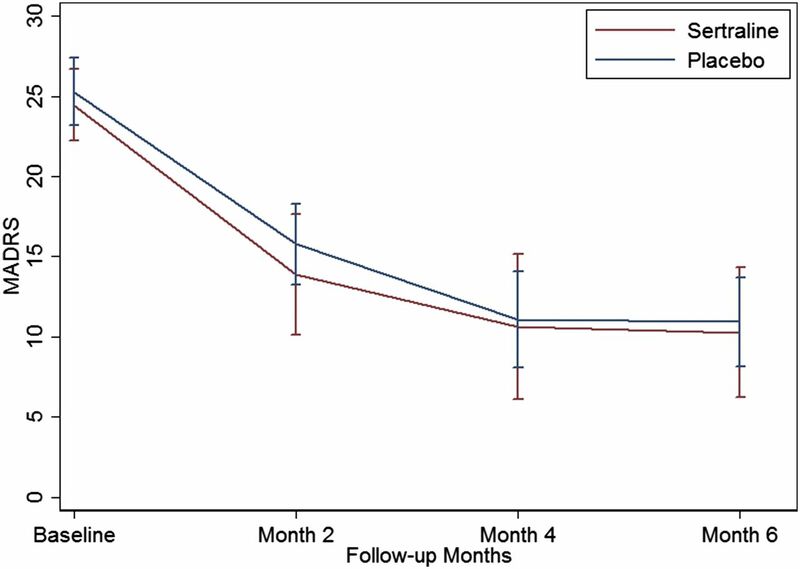 In the placebo group, one patient withdrew after the baseline interview because of concern about taking additional medication, and a second decided against continuing after 3 months. The number of dropouts due to adverse or severe adverse events was greater in the sertraline group (33% versus 0%; P=0.04). Patients who withdrew were older (70 versus 54 years old; P=0.001) and had lower baseline hemoglobin levels (109 versus 121 g/L; P=0.04). With regard to clinical outcomes, there was a significant fall in the BDI-II scores from baseline to month 6 (29.1±8.4 to 17.3±12.4; P<0.001) and the MADRS scores (24.9±4.3 to 10.7±5.2; P<0.001), with similar significant falls in both sertraline and placebo groups (Figure 2). Mean change in MADRS score over the 6 months of the study was −14.5 (95% confidence interval [95% CI], −20.2 to −8.8) in the sertraline group and−14.9 (95% CI, −18.4 to −11.5) in the placebo group. Changes in BDI-II scores were similar at −15.7 (95% CI, −24.3 to −7.1) in the sertraline group and −13.0 (95% CI, 19.6 to −6.4) in those on placebo. There were no statistically reliable differences between the groups. For the MADRS scores, there were no differences between groups at any other time point with respect to change from baseline values. The maximum difference occurred at 2 months, at which stage nine patients remained on sertraline and 14 remained on placebo (MADRS scores: 13.9±5.7 and 15.8±4.8, respectively; difference of 1.89; 95% CI, −2.7 to 6.5; P=0.20) (Figure 2, Table 3). Change in Montgomery–Asberg Depression Rating Scale (MADRS) scores in response to sertraline and placebo. The lines represent the MADRS scores for the sertraline (red) and placebo (blue) groups at baseline and 2, 4, and 6 months. The 95% confidence intervals are estimated at each time point for both groups. The confidence intervals for the sertraline group are larger at later time points due to the smaller group size. Eighteen patients experienced adverse events (24) and/or SAEs (13), nine in each randomized group. Infections (8) and nausea (4) were the most commonly reported adverse events. With regard to the SAEs, there was one death that was possibly related to the study medication as mentioned above, six SAEs that were unlikely to be related, and six SAEs that were not related to the study medication. Mean medication adherence among those who completed the study estimated by a count of returned tablets was 88% (range =46%–100%). In only one was adherence (46%) <75%. Pre- and postdialysis plasma sertraline blood levels were analyzed after unblinding at the end of the study. Six patients were taking 100 mg daily. In one of these patients, levels were unmeasurable due to an interfering compound in the sample—possibly verapamil. Mean pre- and postdialysis levels in the remaining five were similar at 32±12 and 34±18 μg/L, respectively. The remaining two patients were taking 50 mg daily. In both of these, levels were <10 μg/L. One was 46% adherent on tablet count, and the other was 94% adherent. Sixteen semistructured interviews were conducted: 14 with trial patients and two with patients who had decided against entering the trial. No major issues were raised regarding trial format and procedures. However, both of those not entering the trial and another who withdrew early felt that they were not sufficiently depressed to warrant antidepressants. They were reluctant to take additional medication, citing current pill burden and concerns about becoming reliant on antidepressants. Our results have confirmed that many patients on hemodialysis suffer from significant depression. A high proportion (32.3%) screened positive by BDI-II. Despite this high prevalence, recruitment to the RCT was difficult. Over 70% of the 231 positively BDI-II–screened patients were ineligible or unwilling to consent to psychiatric interview. The most common reason for noneligibility (52%) was current antidepressant medication and/or psychologic therapy. A sizable proportion of those eligible for interview (38%) declined to participate. Data from the semistructured interviews suggest that some patients felt insufficiently depressed to warrant additional medication. There were also concerns about adding to already considerable pill burdens and becoming dependent on antidepressant drugs. Lack of patient equipoise may well have been a factor limiting recruitment. The exclusion criteria that we applied may also have been overly rigorous. Such factors contributed to only 30 patients entering the RCT—only one half of the intended sample size. Attention to these issues could inform design of a larger trial. Other factors may also have relevance to the planning of a larger study. These include dropout rate and likely adherence to medication. Only 53% of patients on sertraline completed the study as opposed to 87% of patients on placebo completed the study. There were five dropouts due to adverse events and SAEs, including one death, in the sertraline group compared with none in the placebo group, indicating the possibility that sertraline may cause harm in this setting. Among those remaining in the study, adherence to the medication, assessed by pill counts and blood levels of sertraline, seems to have been adequate. We also confirmed that sertraline is not removed substantially by the hemodialysis procedure. 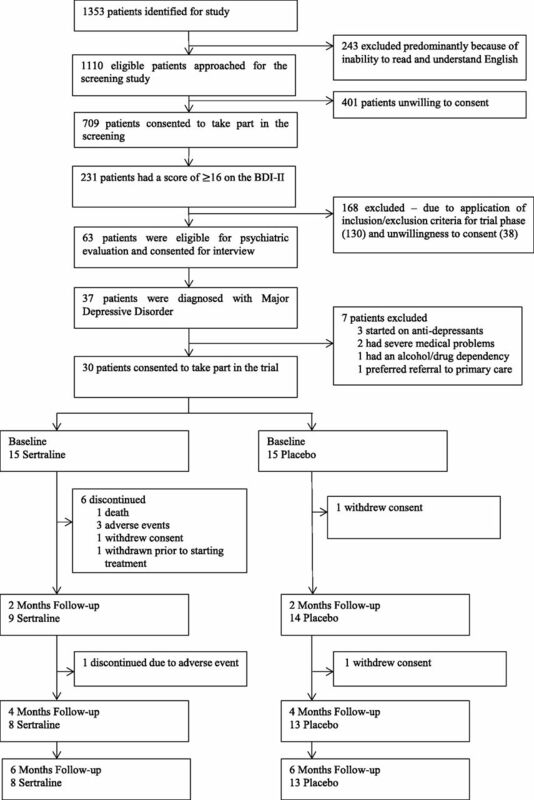 Depression scores (BDI-II and MADRS) improved significantly in both sertraline and placebo groups over 6 months. There was no significant difference between the groups. This may indicate a strong placebo effect, indicate the effect of study participation (Hawthorne effect), or perhaps, reflect the natural history of MDD in this setting. A major reason for performing the feasibility study was to evaluate variance in the clinical outcome measures (MADRS and BDI-II) to allow estimation of the effect size to inform power calculations for a larger study. Our findings in this respect strongly suggest that, in planning a definitive study, a change of approach will be required, incorporating measures to increase eligibility and improve participation and continuation in the study. Without such changes, it may not be feasible to pursue a definitive study to answer this question. Inclusion/exclusion criteria could be amended to allow inclusion of patients currently taking antidepressants. This would entail stopping the antidepressant in patients with clinically appropriate cases followed by randomization to either restarting antidepressant medication after a suitable washout period or continuing without it. If this is possible, it would substantially reduce the number needed to be screened. A shorter follow-up period of 2–3 months would reduce study costs but would be unlikely to reduce dropout rates, because these mainly tended to occur early in the course of our study. As in this study, depression should be diagnosed by diagnostic interview rather than questionnaires given the high degree of symptom overlap between depression and advanced kidney disease. Our study has limitations, particularly a small sample size. RCT recruitment was difficult and constrained by exclusion of a high number of patients, a large proportion of whom were already receiving treatment for depression, and reluctance of chronically ill patients to participate. Such problems have also hampered recruitment to trials of antidepressant medication in other chronic disease settings (28). Considering the feasibility design and the small sample size, the clinical outcomes that we have described need to be interpreted with great caution. Nevertheless, this feasibility study is the largest randomized trial of an antidepressant in patients on hemodialysis to date. Current United Kingdom guidelines for treating depression in patients with chronic physical illness issued by NICE advocate pharmacologic therapy for patients with MDD (19). Our study raises concerns about the benefits and risks of this approach in patients on hemodialysis, a highly comorbid group with a huge pill burden confounding their high prevalence of depression. Current practice patterns may be subjecting patients to substantial risk for little or no benefit. Identifying whether antidepressant medication is effective in this context is a major clinical need. We agree with the European Renal Best Practice Group recommendations and those of a recent Cochrane review for large, well designed, randomized studies of antidepressants versus placebo in this setting (8,18). We acknowledge the difficulties of performing such a study in this population, but in view of the current widespread use of antidepressants in this setting, the lack of evidence of efficacy, and the potential for adverse effects, it is important to explore ways of achieving this. Our findings may be helpful in this respect. The authors acknowledge the help of the nurses and clinical studies officers at the West Midlands Mental Health Research Network and the psychiatric specialist registrars, pharmacy staff, and other clinical staff on the hemodialysis units at the five different research sites who were involved with data collection and data entry. We also thank the principal investigators Dr. Enric Vilar and Dr. Ian Barton. In addition, the authors thank the Norwich Clinical Trials Unit for their support with data management and independent monitoring of the study. Finally, the team acknowledges the assistance of the Royal Free Drug Manufacturing Unit with the provision of the study medication. Funding for this study was from National Institute for Health Research Programme Research for Patient Benefit grant PB-PG-0110-21073. The data herein have previously been presented in abstract form at the American Society of Nephrology 2015 Meeting (San Diego, CA, November 7, 2015). This report is independent research commissioned by the National Institute for Health Research (Research for Patient Benefit). The views expressed in this publication are those of the authors and are not necessarily those of the National Health Service, the National Institute for Health Research, or the Department of Health. The authors had full access to all of the data in the study and had the final responsibility for the decision to submit to publication. See related editorial, “We Need to Talk about Depression and Dialysis: but What Questions Should We Ask, and Does Anyone Know the Answers?,” on pages 222–224. This article contains supplemental material online at http://cjasn.asnjournals.org/lookup/suppl/doi:10.2215/CJN.02120216/-/DCSupplemental.